There are just a handful of shopping days left until Christmas (I'm not panicking, because I'm in denial!). And there are even fewer days until the last chance to make a donation to one of the city's annual holiday toy drives. These drives distribute toys to families in need in the GTA, so that every child has the opportunity to receive a gift during the holiday season. Most local toy drives are reporting that what they need most are gifts for infants ages 0-2, and 'tweens' and teenagers 11-18. For those of us who find the needs and desires of these age groups a total mystery, the CHUM/CP24 "Christmas Wish" website has a shopping list with helpful suggestions. Baby toys seem pretty straightforward, and it was interesting to learn that the needs and desires of the tween and teen sets aren't all that much different from my own: electronics, sports equipment (I guess on this one, tw/eens and I differ. Although I could use a new pair of runners...), personal care items, fashion accessories (I am *right there* with you, tw/eens) and of course, here's a perfectly acceptable occasion to opt for the gift that says "I hereby acknowledge that I don't know you at all": gift certificates for most of the usual suspects. The Toronto Fire Fighters' Toy Drive is on until December 24th. Those who wish to donate (or who are looking for a solid excuse ogle firefighters) can bring new, unwrapped toys or sports supplies to their nearest Toronto Fire Services location. Firefighter volunteers will distribute the gifts to infants and children up to 17 years of age who are in hospitals or shelters. The St. James Town Safety Committee's annual holiday toy drive is reporting an increase in toy requests, leaving them with a shortage of donations. A recent article in the Toronto Sun helped begin to bridge the gap, but they still need approximately 800 toys to ensure that no child in St. James Town, a neighbourhood where about 40% live below the poverty line, will be disappointed. Toys can be dropped off 24 hours a day under the Toronto Sun's Christmas tree at 333 King St. E, or with the St. James Town Committee at 240 Wellesley St. E., Sub Basement. The St. James Town safety committee can be contacted directly at 416-934-0171 (they are hoping to receive all donations by December 20th). Yonge Street Mission runs an annual holiday toy market where their registered clients can personally select a donated toy for their child. The last day for toy donations is December 23rd, and toys for the YSM Toy Market can be dropped off at 306 Gerrard St. E. Their wish list (which also includes a list of much-needed items for their food bank at 270 Gerrard) can be found here (PDF). 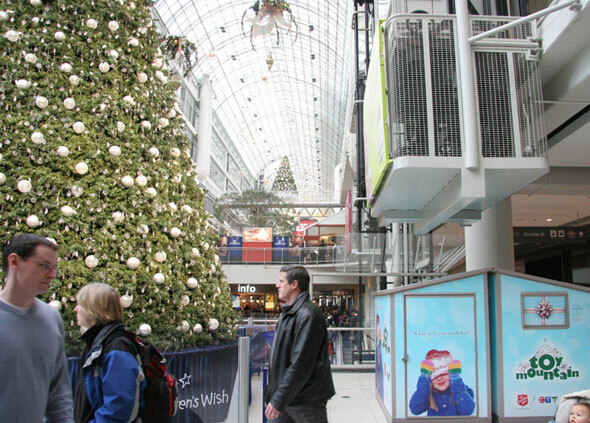 The CHUM/CP24 43rd Annual "Christmas Wish" (they're the "Give A Kid A Christmas" campaign) is on until December 23rd. Bring a new, unwrapped toy (or a cash or cheque donation) to any of their drop-off locations and, you know... Give a kid a Christmas. The Salvation Army and CTV's annual "Toy Mountain" campaign is accepting new, unwrapped toys (as well as cash donations so that they can make bulk toy purchases) until December 23rd. Last year the people in the GTA donated over 102,000 toys for families in need, but as has been the case with local food banks, donations appear to be down this year. As of Friday, December 18th, the Toy Mountain toymometre (my terrible pun, not theirs) shows a count of 54,075* toys - just under halfway to the 2009 goal of 110,000 toys. (*It was, however, also displaying the same number on Thursday. So it's entirely possible that this figure is somewhat out of date). A final consideration: the CHUM/CP24 Christmas Wish website states that toy (and, one can extrapolate, actual) guns, knives or war games of any kind are not considered acceptable gifts for children of any age.